Last year I spent a decent amount of time contributing a TableFilter control to the ControlsFX project. It was inspired by Eugene Ryzhikov’s SwingBits project which contained a table filtering control for Swing. After recently making some enhancements, it seemed like a good time to share the TableFilter and what it can do. I hope it enriches your UI much like the rest of the ControlsFX project has done for me. The TableFilter behaves very similarly to Excel's spreadsheet filter. Right-clicking on a column header will make it visible, and a searchable checklist of distinct values for that column allows you to quickly filter for data. You can always remove the filter by right-clicking any column and clicking RESET to clear the filter for that particular column, or RESET ALL to remove all filters for all columns. There may be a need to customize search "strategies" for distinct values, such as wildcards, regular expressions, date and number comparisons, etc. The TableFilter control does all the above, and after a lot of work I have used it in production for about six months. My clients have been extremely satisfied with it and it has worked reliably. The TableFilter will swap out the ObservableList of items with a FilteredList. This FilteredList will only display items that qualify on all column's respective filters. This means you can execute filters on more than one column in combination. For instance, we have already filtered to records where the last name is "Warren". We can add another filter where the age is 16. 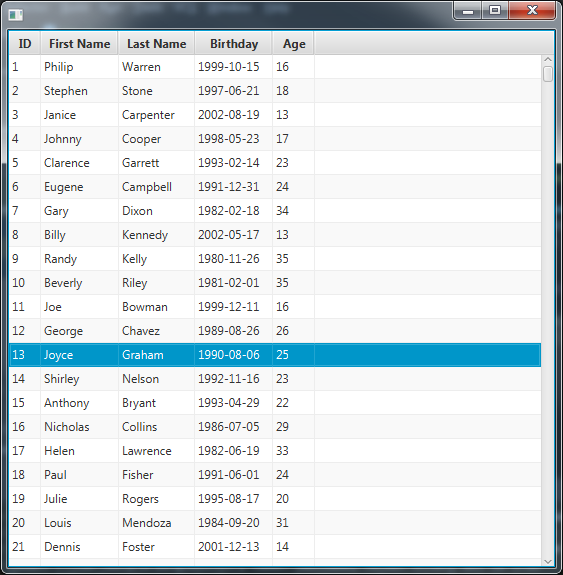 Note that when I right-click the "Age" column, values that are no longer visible due to the "Last Name" filter are grayed out. You can use the "NONE" button to unselect all values and pick the value(s) you are interested in. 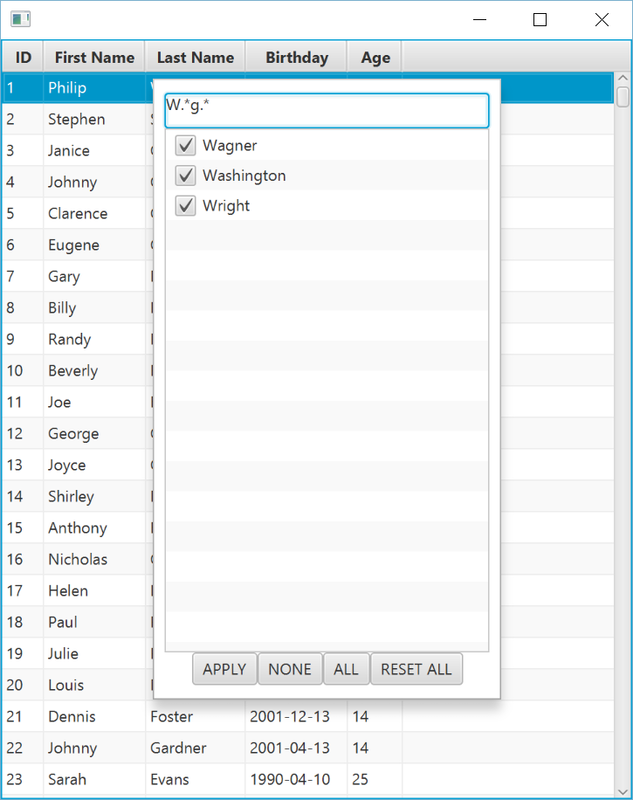 You can remove all filters from all columns by right-clicking any column and clicking "RESET ALL". One simple but highly flexible configuration you can do with the TableFilter is change the search behavior on the search box. By default, the search box will filter distinct values based on the inputted String, and pass it to the contains() method of each distinct value's toString(). Effectively, whatever input you type in the search box will match distinct values that contain it. You can change this behavior easily by passing a BiPredicate<String,String> lambda, where the first String parameter is the "input" from the search box, and the second String value is the "target" representing each distinct value. Using these two String inputs, you can do any matching logic that returns a boolean. 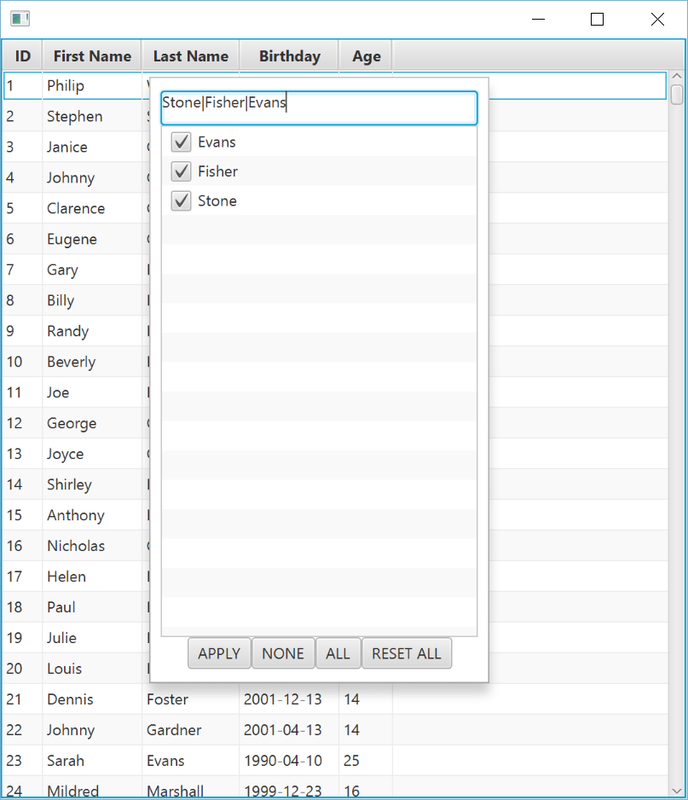 For example, you can implement the search box behavior to use regular expressions for the table filters. Now I can use regular expressions to search through the distinct values. Note I had to use the try-catch because event-driven text inputs will likely contain broken regular expressions, especially as they are being typed. When the typed input is currently not a valid regular expression, I just default the qualification to false. Not that all values for all columns are searched by their toString() values. This makes sense since you are searching by typing in String inputs, so the distinct values should be compared to the input as String values as well. You can do other behaviors, like using startsWith() instead of contains() or even a wildcard pattern system. Currently, the API is set up to use one search strategy for all column filters. I may explore column-specific search behaviors later but for now I feel it would complicate the API. But with a little effort, you can create more complex search strategies that recognize numbers, dates, and even simple math expressions. For example, you could evaluate if the two String inputs are numbers. If the numeric input starts with a "less than" symbol, as in "<120", you would then only qualify distinct values that are less than 120. This sounds involved but I have found it is not much work, and it just requires a few nested case statements. I have even developed implementations that can work with date strings of various formats. Because the TableFilter commandeers the TableView's backing ObservableList and replaces it with a FilteredList, you will get errors when trying to modify the backing ObservableList of items returned from getItems(). To modify the "backing list" of items for a TableView, call the getBackingList() method on the TableFilter and modify that instead to update the TableView. I hope you find the TableFilter useful. It is currently available in the ControlsFX project but an improved version (which includes the custom search strategy and fixes for nullability issues) is available in the coming release. Please let us know what you think and do not hesitate to get involved if you have ideas or improvements. Great job. The first thing that I see is that there isn’t the usual filter icon on the column that has a filter set. I think this is very very important for the user experience. In this case the stuff should be managed manually? Yes, the icon has occurred to me and I agree that would increase usability. Just haven’t gotten around to it yet. I wont complain if someone else wants to beat me to implementing it though. I think the comment system is broken :/ Vowels are missing. I added filter icons and improved some of the visuals (including ridding the blue highight). The TableColumn will even bump a few pixels wider to make room for the filter icon. I’ll put in a PR. Brilliant control! Thank you for contributing to the community! I was looking for this type of functionality – so great job. Any idea on when the next version of ControlsFX will be available? We can’t use the ControlsFX Project in our development, as we need to use the released tooling. Forgot to ask this above – from your code sample – this should be fully compatible with SceneBuilder since there is no layout portion of this – is this a correct assumption? Also – will this still support sorting the table based on the headers? It will apply the sorters for you. Regarding SceneBuilder I don’t know since I am not a heavy user of it. Jonathan Giles might be able to provide answers to that as well as the release once it is planned. 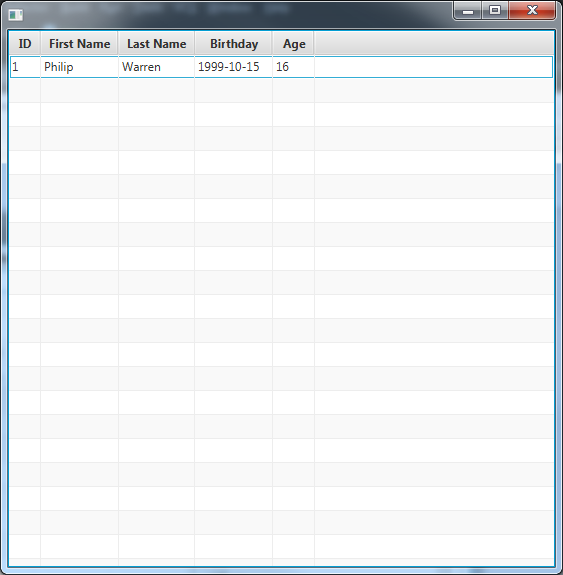 the filter is great but if I load small Data in my TableView (66 entries) the filter works fine. When I load more Data (~66000] the app crash when aktivating filter. I have made some substantial improvements in a pull request this week and overhauled the backing engine to support a high volume of records. I even added listeners for cell value changes. Feel free to watch (or even use) this PR and it should be in the next release. Getting a few NPE stack traces from the logs when viewing it on my table. 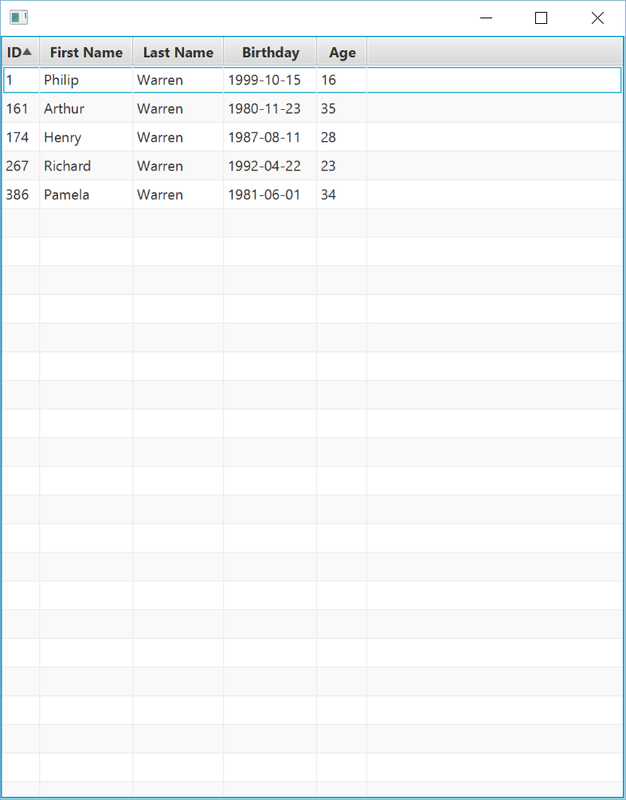 Some columns have empty entries. This was resolved awhile ago. Can you make sure you have the latest release? Error = NULL POINTER EXCEPTION. Currently I have had to create a custom modification in my class files getters and setters to handle nulls and replace them with an appropriate value to fix the issue. My question is are you going to allow the TableFilter class to handle nulls? or is there already an easy way to do this that I am not aware of? Thanks alot for the help. Hi Josh, this issue has been resolved along with many enhancements in the current build on BitBucket. The release version does not reflect any of these fixes or enhancements yet. Go ahead and do a build, and that will resolve your issue. Where I can download jar ? Awesome control, thank you! But how can I specify columns I don’t want to allow to filter? That currently is not an option but perhaps can be added. Just curious, are you preventing a certain column from being filterable because its a performance-expensive column? Or is it simply a business reason? If it’s the former, you can use the lazy configuration. For the latter, keep in mind that may not be intuitive for users and they may think it’s broken. Hello Thomas, thank you for your reply. I asked for the following reasons. In my table I have a column that contains just “Delete” button to delete the appropriate row. So it doesn’t make sense to filter it. Or the second case: I have a datetime column where all values are unique and the difference between them is in milliseconds. And there is no business reason to filter them as well. Ah, that makes sense and are valid cases to suppress the filters. Let me think about it as I’m considering ways to open up the API a bit more to configure specific columns. I’ve been busy with RxJavaFX stuff and I’m traveling this week, but I’ll take a look and see if I can add that option easily. Any updates on specifying columns without filtering option? I am using large tables. In columns with a lot of different values it has performance impact. Can I make a request for enhancement? I currently use a Jidesoft library with swing applications that offers similar functionality but has one particular advantage – it allows for custom filters. For example, if a column contains numbers, the custom filters include: is any number, equals, doesn’t equal, is in, isn’t in, is empty, is not empty, etc. etc. The custom filters are tailored to the column data type and the initial view is just a simple listing of the available values (no checkboxs) plus (All) and (Custom) at the head of the list. Clicking a vlaue filters the table for that single value, selecting ‘Custom’ pops up a dialog that allows for multiple slections by checkbox using the ‘is in’ predicate. Overall, the interface is cleaner and has a good deal more functionality. Given that you have already gone to considerable effort to produce a workable filtering solution I wonder if you are open to enhancements? I’ve definitely thought about this before, just never have gotten around to it. I think the best approach would be to open up the API and then have a custom menu developers can put items into. Can you open an issue on BitBucket so we can track it? thank you for this great component. I am experiencing a problem whit a table for which I have defined a custom CellFactory on a Column: when I apply a filter the cell(s) of that particular column that belong to filtered rows still appear, and display a wrong value (the one from the previous row). Is this an issue/limitation with the component? If this filter supports sorting, could you give me a quick example of how sort? Thank you! When I type a search query in the box, I see the matching entries below. However if I uncheck some of the matching entries and hit ‘Apply’, all of the search results are included in the table rows, including the entries which I unchecked. Is this a known issue/my misuse of the API, a new issue, or has it been solved since cfx 8.40.12? That sounds like an issue. Can you file an issue and I’ll see if I can get to it hopefully within a few weeks? A query. Can I use this filter to generate reports? I see the TableFilter is now deprecated. Is that true? Is there an alternative option for the same? This is a great component! Thanks a lot! I’m having a problem clearing the BackingList. I’m just calling filter.getBackingList().clear() and I am receiving a java.util.NoSuchElementException: No value present. I have tried putting it on a Platform.runLater and using retainAll and etc but nothing seems to work. This was addressed about a month ago, but has not been released officially in a build yet. You can build a snapshot of ControlsFX to resolve this issue now. So, I solved it by cloning the version I was using and applying the same changes Thomas applied on his pull request (https://bitbucket.org/controlsfx/controlsfx/issues/704/nosuchelementexception-on-columnfilter). Then I built it again and it Works. This is a really useful addition to TableView but as we use Pagination with our TableViews, the fact that it replaces the TableView’s items list is a problem. Do you think it would be a reasonable enhancement to add a “backing list” property to the Builder? The TableFilter could then (optionally) use that list instead and not replace the TableView’s items list (and provide an accessor for the SortedList so we can use it for paging)? That seems sensible. Not hard really either. Can you submit an issue and I’ll try to get to it soon? I don’t think it is as straightforward as you make it sound. It might be, but I would have to think it through and understand your use case better. I’ll tell you what, if you want to clone the project and see if you can modify it to get it working for you, put in a PR and I’ll see if it breaks anything. Thanks for the quick response, I’ll certainly try to find time to do that – just wanted to see if there might be any obvious reason why not before making any formal request. I did run a hacky “test” by copying the source to a temporary test package and modifying the code there and it seemed to resolve our problem at first glance. 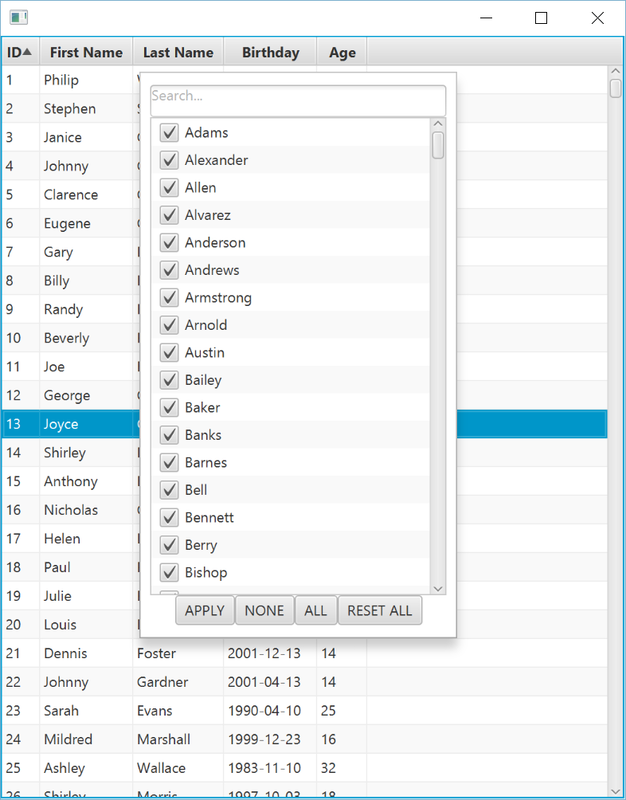 Our basic requirement is to use paging (we use a javafx.scene.control.Pagination control) rather than scrolling through the “whole” list, so that the TableView’s items list is actually a sublist of the sorted backing list. Will check but not sure I see how that would work… wouldn’t the Comparator then be operating only on the current page, not the entire list? For a very simple example, imagine a paged table with a single String column, showing a list of the letters of the alphabet and a page size of 10. It would therefore have 3 pages and initially show page 1 with letters A-J, in that order. If I reverse the column’s sort order via the table column the table should stay on page 1 and show Z-Q, not J-A. I run into two issues when trying to add it to my Tableview. Maybe you have a pointer for me how to fix them. Exception in thread “JavaFX Application Thread” java.lang.RuntimeException: TableColumn.prefWidth : A bound value cannot be set. this is a great control. I didn’t find an API to read and preselect the filters, e.g. when you want to reload a table and preserve the filter settings. Is there a way you can achieve this? I think there is. I am swamped but explore the methods and you should see there is a way. I’ll do my best to follow up later. but the class FilterValue is not visible. Also I did not find a method to select values, only to unselect, which also doesn’t work in my setup. This is awesome tks, saved me a lot of work. i was implementing something similar when i found it. How would one go about changing the strings in the apply, reset, etc.. buttons? i need them in spanish. is this i18n ? Is there not another way? I want to access the node, make the spacing of the HBox or whatever it is higher so it doesn’t look that ugly and replace the Text with an Icon/Image. Please help..
Hi, great control which saved lots of work. Thank you! As Tanya mentioned I would like to specify columns I don’t want to allow to filter and/or be able to strip HTML content. We use WebView to show formatted text in TableCells and would like to show the plain text instead of HTML at the filter control. Wow, what a breeze to apply. Thanks for the great control. The only issue I worry about is my users not knowing that they can filter by right-clicking the column. I was thinking maybe doing something onHover—like flashing the little sort icon when they hover over the column header. Very useful, nice job. One small question: is it possible to have the focus in the search box when opened? I started to use the TableFilter and I like it! The filtering through the user interface works fine. Besides that I wanted to provide also filtering through my own widgets like buttons etc. I assumed the following should work but it does not. Any ideas/proposals? I also submitted an issue because I think it is a bug (https://bitbucket.org/controlsfx/controlsfx/issues/843/programmatic-tableview-filter-does-not). Please state me wrong! Fantastic component and so easy to use. Great job. The List View in the Context Menu popup does not seem to use the cell factories from the table column to render the filter items. Is there a way to set a cell factory for the list view popup so they’re rendered the same as the table column items? Hi Jonathan Giles, Nice to have this feature and I have implemented this filter feature in one of my current project. I have a requirement after applying filter it shows few results which needs to be captured and do some math on it and display the updated value in one of the row. I tried List change listener that didn’t help me to fetch this values whenever I applied filter to get the remaining value from tableview. Is there any listener available to perform an action when I click on apply to filter the data. Any suggestions or ideas are appreciated how can i implement it!! Is it possible to filter on ImageViews? 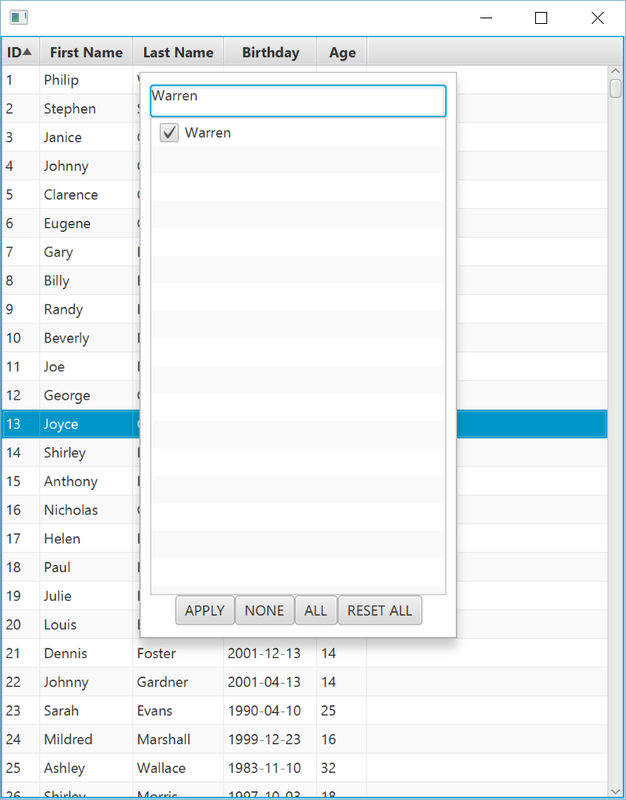 In mij TableView I have a column that indicates True or False. But instead showing true or false, I show ImageViews (green check icon or red cross icon). If I filter, the TableFilter shows me the toString of every ImageView object. Is it possible to view only “True / False” in the tableFilter and thus filter on my ImageViews? new TableFilter(TableView) is now deprecated. Please update how to use it & more-importantly, at the top of the TableFilter javadoc. It didn’t populate unless I called it AFTER I had set the items. A good tip to tell people. Also, it didn’t work initially because I already had a context menu for COPY functionality. Not sure how to blend these.